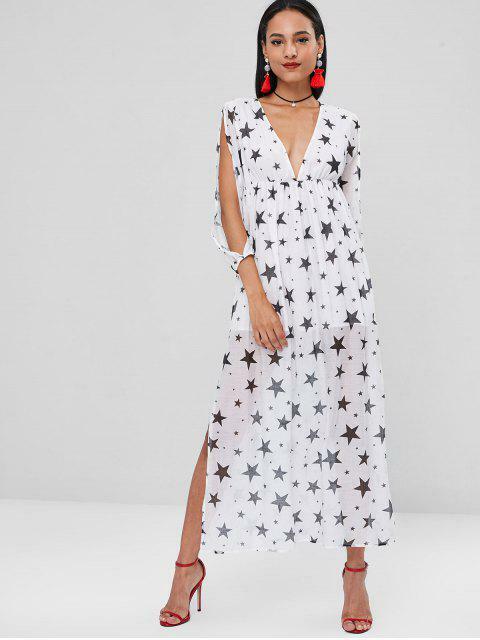 [41% OFF] 2019 Stars Print Long Slit Split Sleeve Dress In WHITE | ZAFUL ..
Just sway the steps with the cool breeze for a graceful look! Featuring star prints throughout and perfectly cut in an ankle length with high slits to show off the slim legs, this dress has a sultry plunge collarline and sleek split sleeves to cool the arms. The fabric is so soft and smooth that you will love the dress once you wear on it. It is also a great dress for the seaside holidays!